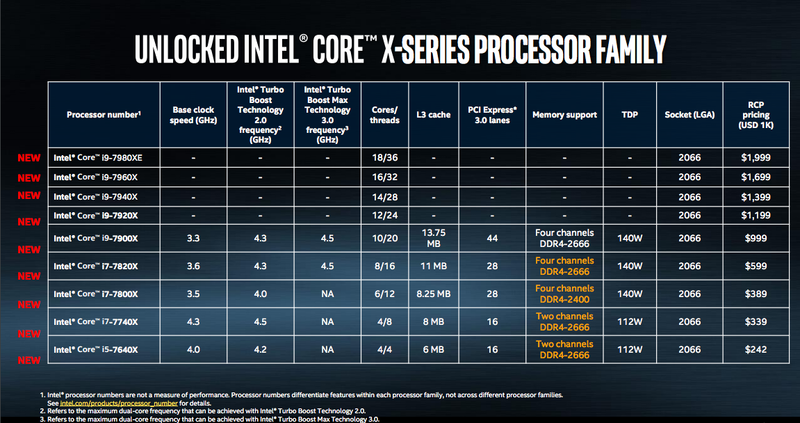 At its Computex event in Taipei today, Intel unveiled its new Core X-series of processors. The debut of its latest high-end desktop CPUs wasn’t a surprise after plans were leaked earlier this month, but the series’ flagship model — the 18-core, 36-thread Intel i9-7980XE — still makes a very loud splash. Priced at an eye-watering $1,999, the Intel i9-7980XE will remain aspirational for all but a handful of consumers, but it serves as Intel’s salvo in its ongoing processor battle with AMD. With 16-cores and 32-threads, the AMD Ryzen Threadripper, announced earlier this month, was supposed to be a contender for the world’s most powerful consumer CPU, but it looks like Intel has taken back the mantle for now. Other members of the Core i9 family are more realistically priced and range from $999 for 10 cores to $1,699 for 16 cores (12 and 14 cores are also available). All i9 processors have a base clock speed of 3.3 GHz and go up to 4.3 GHz dual-core frequency with Turbo Boost 2.0 and 4.5 GHz with Turbo Boost Max. Other chips in the line-up are the quad-core i5-7640X and i7 processors with 4, 6 or 8 cores. Intel hasn’t announced shipping dates yet.